This LO was fun to create. We used a technique called half tone….which is a printing technique. It’s the green dots that go down in size. I also used it on the butterfly. I could see this on a phrase or bit of text. I think that would look pretty neat. I’ll have to try that! This was Preston on his birthday with WAY too much sugar in his body! lol His mouth is full of chocolate in case you think he had really BAD teeth! lol And I couldn’t get the two boys, Ben and Preston to take ONE good picture…they were being SO silly! One of both of them had a funny face, or a tongue sticking out! lol Click on the photo to enlarge it. I did it! I created the word halftone, below, using the halftone filter in PS. This entry was posted on Wednesday, February 16th, 2011 at 2:30 pm and is filed under Uncategorized. You can follow any responses to this entry through the RSS 2.0 feed. You can leave a response, or trackback from your own site. 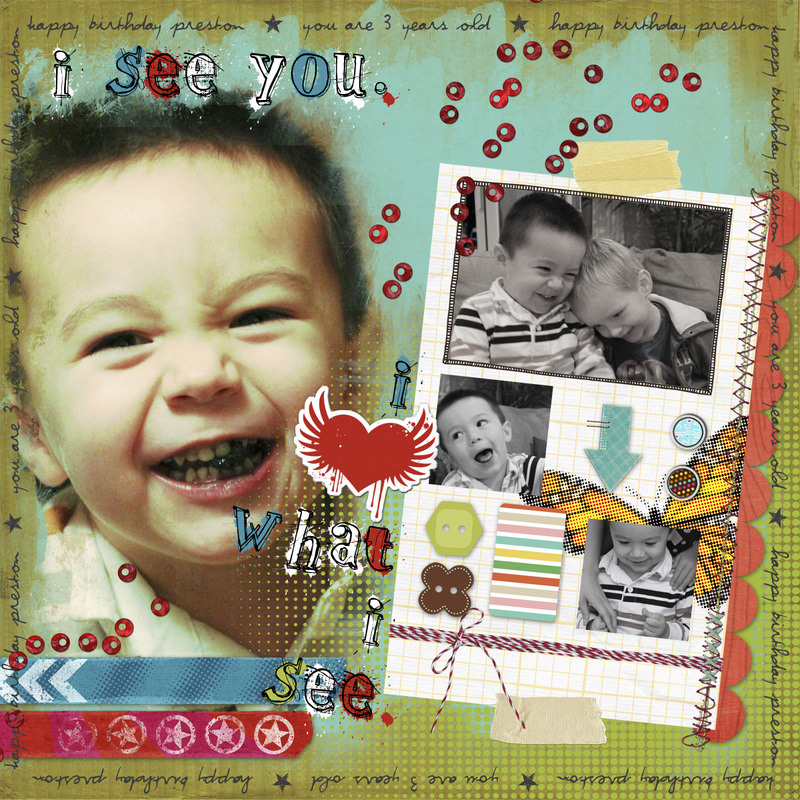 Your layout came out very cute Kathy…I love that big picture of preston…he is quite the little guy!